Dr. Kathryn Hellerstein is Associate Professor of Germanic Languages at the University of Pennsylvania, as well as the Undergraduate Director of the Jewish Studies Program. A poet, translator, and scholar of Yiddish poetry, Hellerstein received her doctorate from Stanford University. 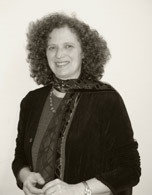 Hellerstein's books include her translation and study of Moyshe-Leyb Halpern's poems, In New York: A Selection, (Jewish Publication Society, 1982), Paper Bridges: Selected Poems of Kadya Molodowsky (Wayne State University Press, 1999), and Jewish American Literature: A Norton Anthology, of which she is co-editor (W. W. Norton, 2001). She is also a major contributor to American Yiddish Poetry: A Bilingual Anthology (University of California Press, 1986). Hellerstein's many scholarly articles on Yiddish literature, and most recently, on women poets in Yiddish, are published in journals, anthologies, and encyclopedias, including Encyclopedia Judaica and Cultural Front: Representing Jews in Eastern Europe, The Jewish Quarterly Review, Prooftexts, Shofar, Source, Chulyot,. Borders, Boundaries and Frames...: Essays from the English Institute, Jewish Women in America: An Historical Encyclopedia, The Anthology in Jewish Literature, and Gender and Text in Modern Hebrew and Yiddish Literature. Individual translations by Hellerstein have been published in Forward, Partisan Review, Kenyon Review, Der Pakn Treger, Two Lines, Princeton University Library Chronicle. Her own poems have appeared in the journals Poetry, Tikkun, Bridges, Religion and Literature, Judaism, Gastronomica, Kerem, Prairie Schooner, and the anthologies Without a Single Answer, Four Centuries of Jewish Women's Spirituality, and Reading Ruth. Her work has also appeared in The New York Times Book Review and The New York Review of Books. Kathryn Hellerstein's current projects include Anthology of Women Yiddish Poets and a critical book, A Question of Tradition: Women Poets in Yiddish. She has received fellowships from the Guggenheim Foundation, as well as from the National Endowment for the Arts, the National Endowment for the Humanities, and the Center for Advanced Judaic Studies at Penn.